The cat triple wall hook is designed to fit any home decor. 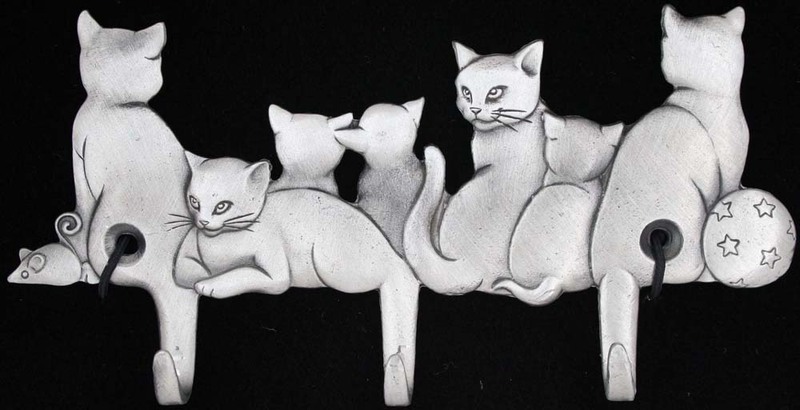 The details of the cats are captured in fine detail. Three hooks on the bottom of this solid Pewter decorator design will surely stand out at your door. Hang your keys here for easy location the next time you need them - solves the problem of missing keys. Also handy for hanging belts, ties, pet items, jewelry, etc. Purchase for your home or give one as a great house warming gift. 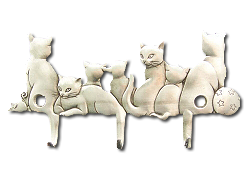 Decorative & detailed cat scene design. Pewter & craftsmanship capture intricate details. Adds a touch of class to any decor. These designs are hand cast, dipped in an antiquing solution, machine tumbled, and hand finished to the highest of quality standards. The triple-hook is then inspected, packaged, and prepared for shipping to you or gift recipient.